When the Tele first arrived, its solid body was a huge innovation - it limited feedback and enabled higher-volume playing, while the no-nonsense construction made for easy mass production. "It wasn't long before the model became the blueprint for the modern electric"
Leo Fender had already brought the single-pickup Esquire to market in 1950, but he quickly found he needed to compete with two- and three-pickup electrics. Fender soon began producing two-pickup Esquires - now with truss rods - dubbing them Broadcasters. The name only lasted three months, after Gretsch politely pointed out its similarity to its Broadkaster drum line. In response, Fender simply cut the headstock decals short, leaving only the Fender name - these valuable models are known as 'Nocasters', and were only produced for half of 1951. Drawing on the television age, manager Don Randall thought up Telecaster, and it wasn't long before the model became the blueprint for the modern electric. The humble Tele has appeared in numerous guises over the years - including the semi-hollow Thinline, neck-humbucker Custom and double-humbucker Deluxe - and fuelled genres from country (Brad Paisley) to rock (Keith Richards) and metal (Jim Root), proving there's plenty of life in the ol' plank yet. Fender launches the Broadcaster, adding a truss rod and extra pickup to the Esquire. Fender is forced to drop the Broadcaster name due to Gretsch's Broadkaster drum range. The company officially renames the Broadcaster as the Telecaster. 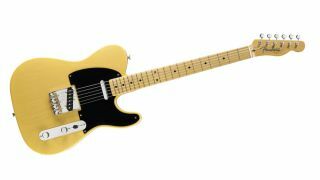 The Telecaster Thinline is introduced, followed by Custom and Deluxe variations.